This is the final installment of our 5-part series highlighting some of the states where you can have a great fall family timeshare rental vacation. Finding everything from pumpkin patches to corn mazes we’ve seen some great places for autumn fun. But along with coconut palms and mango trees, would you ever have thought of Hawaii as a destination for fall festivities? Rent a timeshare on Oahu and discover that Hawaii is also a great state for enjoying traditional fall fun – with a real pumpkin patch, no less! 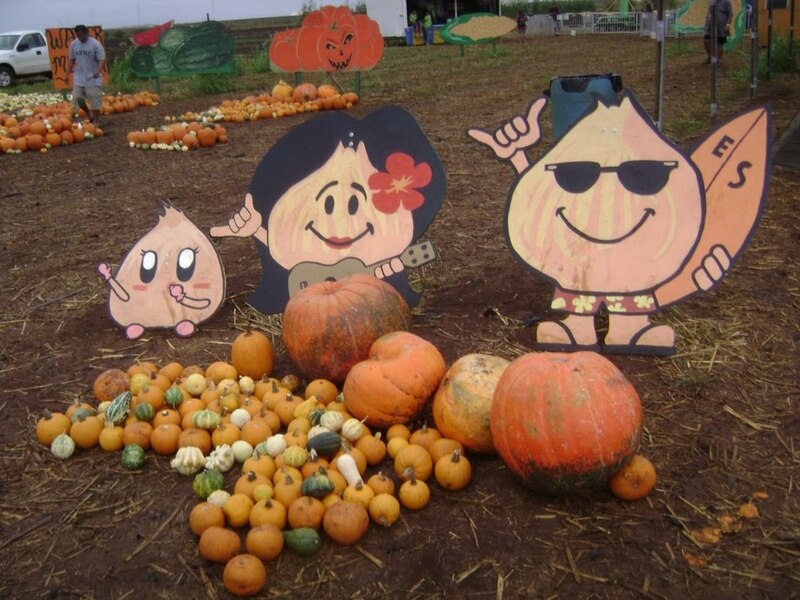 Aloun Farms is where you’ll find The Great Pumpkin Patch in Kapolei. No kidding. From 5 acres of leased land in 1977 the Aloun Sou family has increased production of farm fresh produce to over 3,000 acres. With 80% of fruits and vegetables being imported into the Hawaiian Islands, a source of locally grown produce was long overdue, and Aloun Farms has become widely popular. Realizing that kids of all ages who live on Oahu still enjoy traditional fall festival activities, the Sou family began offering a pumpkin patch experience comparable to any found on the mainland. Although soft trade winds and guava juice take the place of autumn winds and apple cider, you still get to take a hay ride out to the huge pumpkin patch and wander through all of the pumpkin offerings that not only include huge bright-orange jack-o-lantern pumpkins, but also white pumpkins, mini pumpkins, baby pumpkins, and even ornamental gourds. Not to be outdone by any mainland pumpkin patch, Aloun Farms does this autumn tradition up in a big way. Take a look at last year’s numbers: Their vast orange fields – 83 acres to be exact – yielded approximately 71,000 jack-o-lantern pumpkins, 20,000 cooking pumpkins, and114,000 miniature decorative pumpkins. Some pumpkins are 40 pounds and up. In addition to the pumpkin patch, there is a corn field where, for an additional fee, you can pick as much corn as you could carry in a 5 gallon bucket. This fun-filled fall family event also includes pony rides, farm style food including roasted corn, a petting zoo, and there’s even a beautiful picnic area. Oh, and be sure not to miss the Flyin’ Hawaiian Pumpkin Slingshot! Who would have thought that you could take a traditional Hawaiian timeshare rental vacation complete with beaches, out-riggers, and luaus, and mix in there somewhere a real autumn pumpkin patch. That’s just about as perfect a fall vacation as you can get.